I’m trying to go as long as possible before having to decorate birthday party themes for T around cartoon characters. Don’t get me wrong, I love Minnie Mouse as much as the next girl, but there are so many other cute ideas out there. And since T just turned 2-years-old, I wanted to take the opportunity to do something fun for her birthday this year. She loves pinwheels, so I knew that I needed to incorporate them somehow. But then I thought about how nice our backyard could be for a picnic. We have a lot of privacy, and a nice pear tree that provides just the right amount of shade. 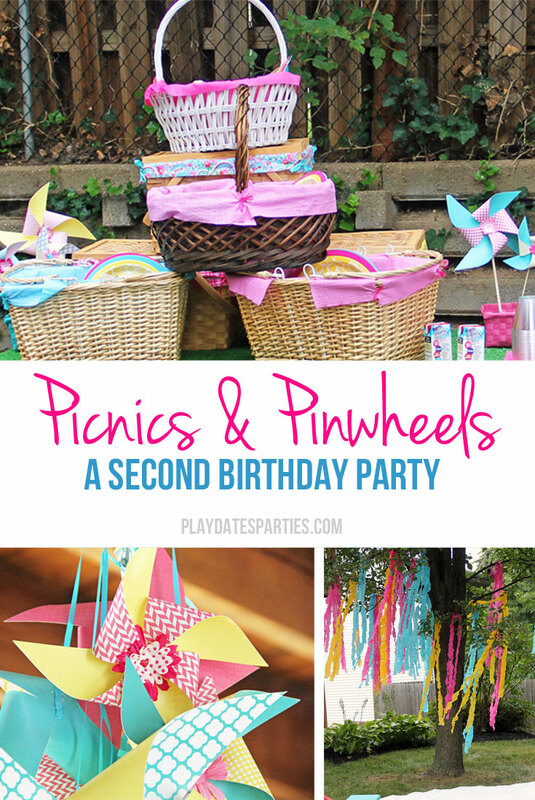 And so the theme of picnics and pinwheels was born! The most time-consuming aspect of this whole party was the baskets. I went to Goodwill countless times to gather picnic baskets, and other large baskets. And then I spent hours seaming together color coordinated liners (remember, I don’t have a sewing machine). I do love how they turned out, though. In order to avoid making a couple dozen baskets, I made large baskets for couples to share and small baskets for each kid. That also allowed me to get creative, and serve some fancier meals to the adults, knowing that the little ones wouldn’t be so interested in artichokes and proscuitto. 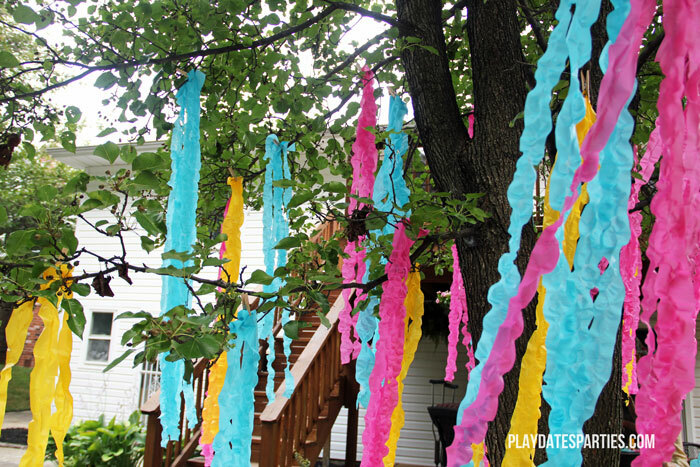 One of my favorite decor elements is the ruffled streamers hung from the pear tree in the backyard. Would you ever guess they are made from cut up plastic tablecloths? And they’re hung from the tree with nothing but clothespins. I love high-impact, inexpensive decorations like that. 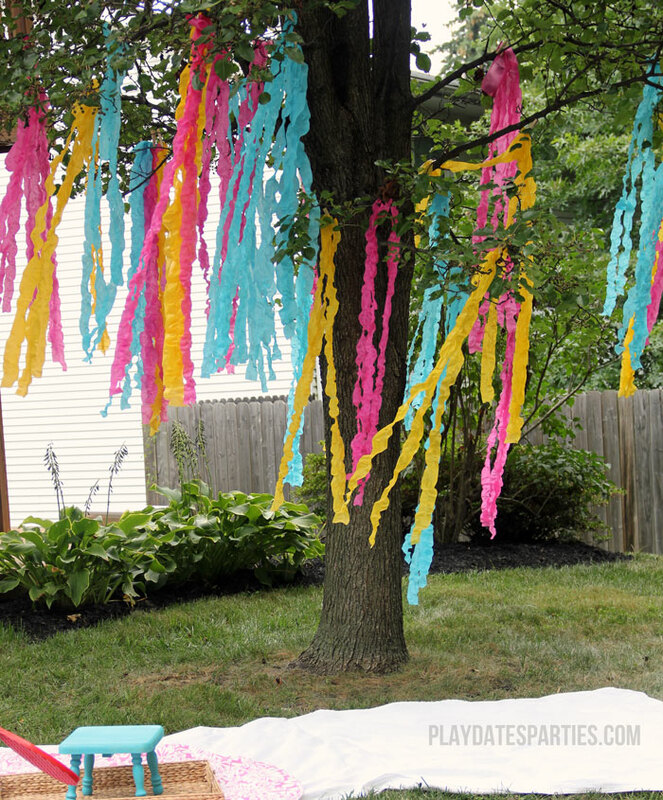 Speaking of low-cost, high-impact decorations…I made nearly 100 paper pinwheels for this party. They were all in different patterns of teal, pink, and yellow. Bright colors to match my girls’ bright personality! 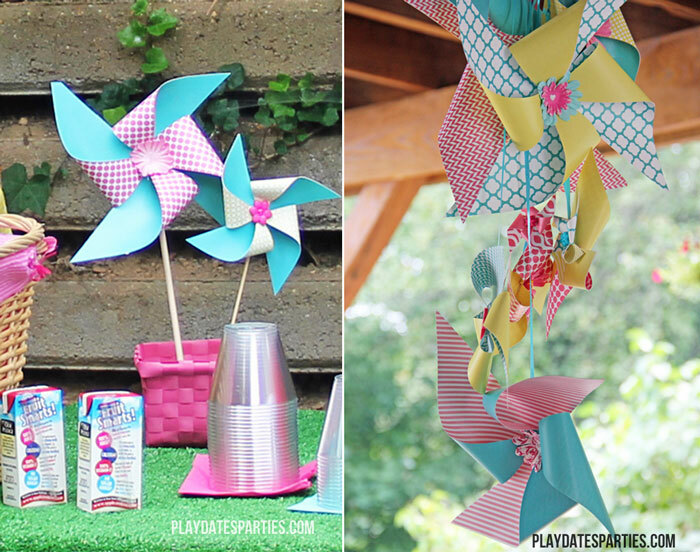 Pinwheels were in centerpieces on the picnic table, on the food packaging, and even strung together to make a pinwheel chandelier. 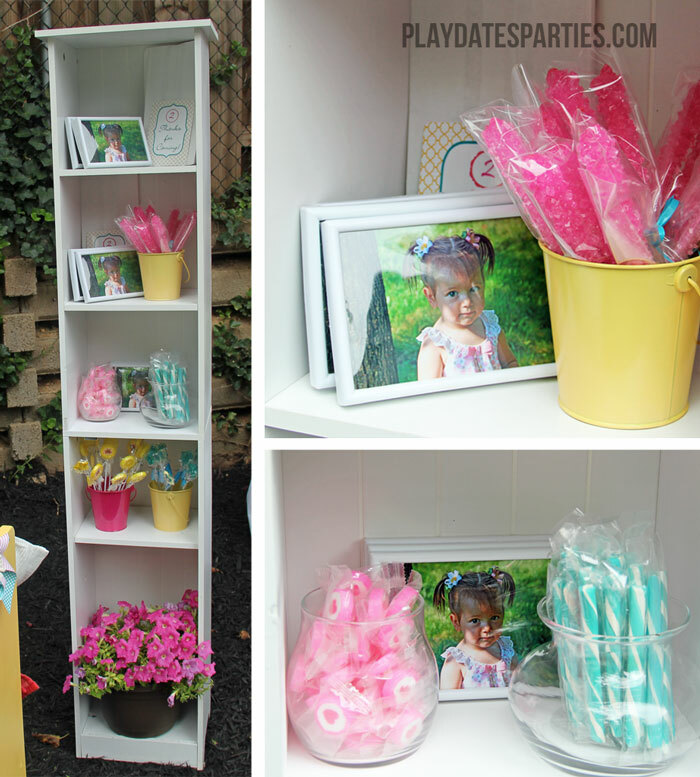 Next to the picnic table, we had a small fill-your-own-favor candy buffet with sweets in all the party colors. I used small painted buckets to hold the candy, and guests got to take home a framed picture of T as well. To finish off this picnic and pinwheels birthday party, we all enjoyed a slice homemade strawberry ice cream cake topped with a trio of more pinwheels. All-in-all, we had a great time. Rain threatened us most of the day, but held off until the party was over. And even though there wasn’t a single Minnie Mouse in sight, T keeps asking us where her party went! 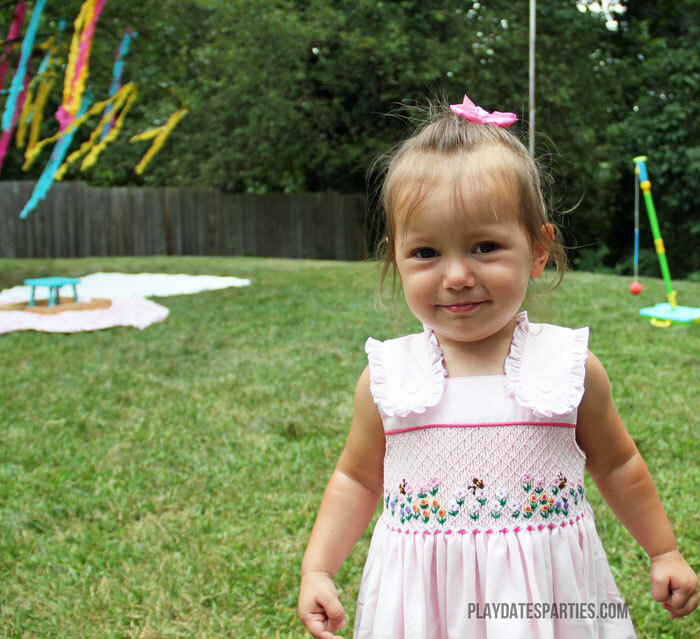 How would you decorate for a picnics and pinwheels birthday party? What a sweet, pretty party! Yes, when they ask where the party went, I'd say it was a hit! Love all the pinwheels and the chandy! So cute! Well, everything was. All the color said Party with a capital P! I made a ribbon carousel for my grandgirl this week. Come see! PS I'm over from Keren's blog. I'd love for you to link up to our Crafts for Under Twenty Somethings party going on now. It's a blog hop specifically for kids and teens related "stuff", so your post would be perfect! Also, any party linked up is added to an ongoing party directory so others can find your party in the future! @Reannah – I actually just did some painting and did use some extra gray on hand. Who knows when I'll get to actually posting it…but thanks for the inspiration! @A Lived In Home – The cake was very tasty…though I'd had different ideas on how it should turn out! Thanks for the sweet comments! @Holly – Thanks for the great comments…I'm still getting remarks from the little one about where her party is and where all her cousins have gone. I think she was just excited to see all of her family! Checked out the ribbon chandelier, and it was adorable! @Melanie – Thanks for stopping by! 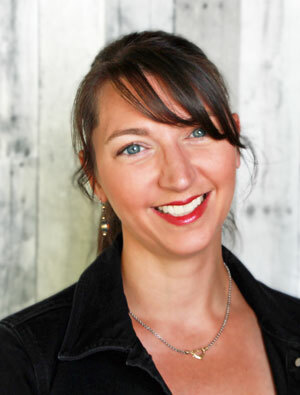 I'll be sure to check out your blog and Craft Party soon! Your party decor looks amazing! You put in a lot of work, but how much fun! Your little girl is adorable, and yes, Minnie Mouse will come soon enough! 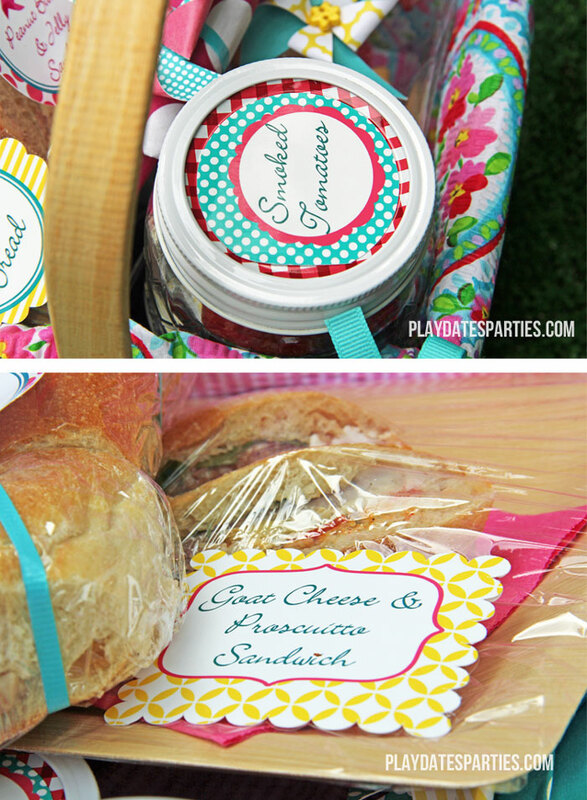 love the picnic idea, that way you can just sit back and enjoy the party, fabulous! thanks for sharing on craft schooling Sunday. Oh, and that cake is totally up my alley, adorable and so simple to make, perfect! Very different and fun theme. Way to think out of the box! 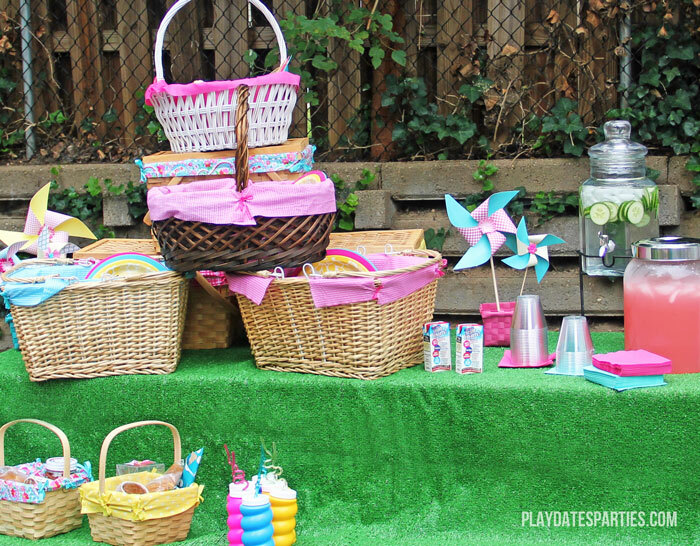 This is just a fun, easily-doable party set up and I just had to choose it as the feature for this week’s Thank Goodness It’s Thursday link party! 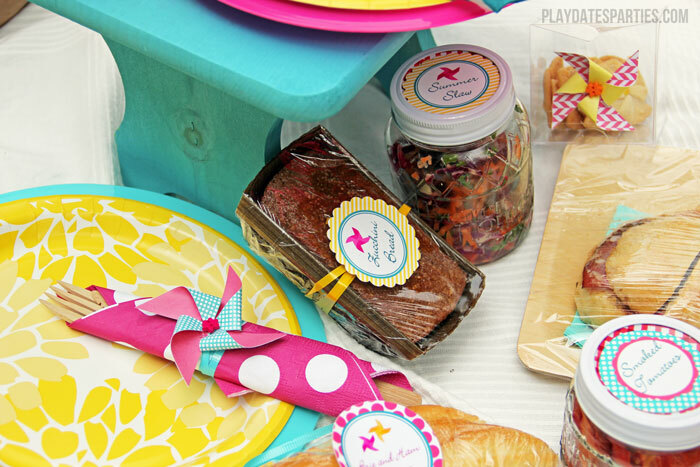 A quick set-up, adorable pinwheels, and that cake (need the recipe) makes this just the sweetest party. Your creativity and love can be seen throughout this amazing party – thank you so much for sharing! 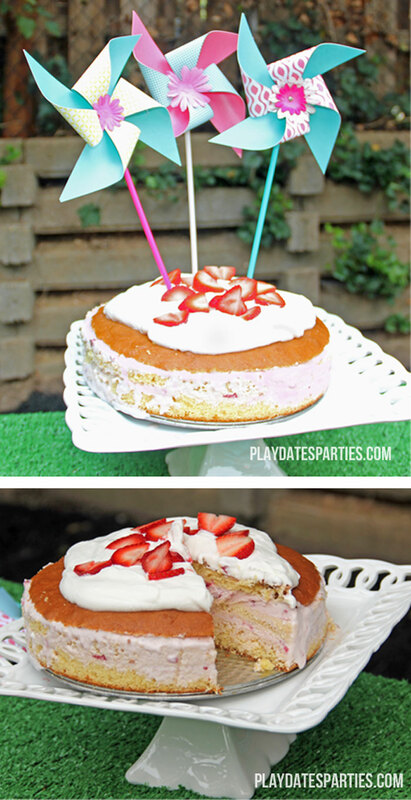 Such a fun idea for a little ones birthday party! 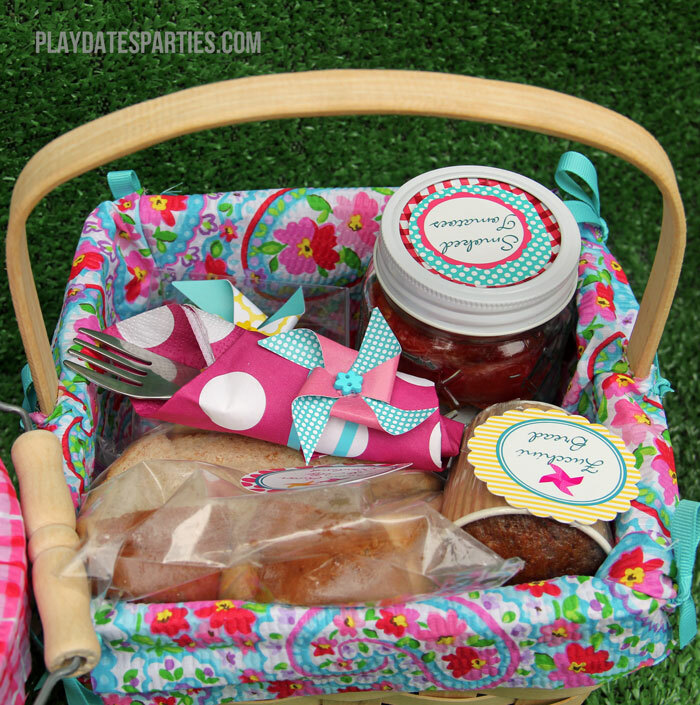 I love the picnic baskets the best! Thanks so much for sharing your creativity at The DIY Collective. Hope to see your awesomeness again this Thursday!